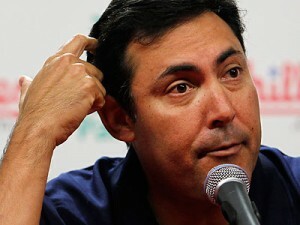 Ruben Amaro Jr. needs his phone to ring. Philadelphia Phillies fans need his phone to ring. Any chance for the Phillies to turn the page on their 2008 World Series Championship team hangs in the balance. The Phillies clubhouse has been champagne free now for three seasons with the Phillies falling further and further off the pace in the National League East. But the Phillies are suffering from a severe hangover from that championship run. 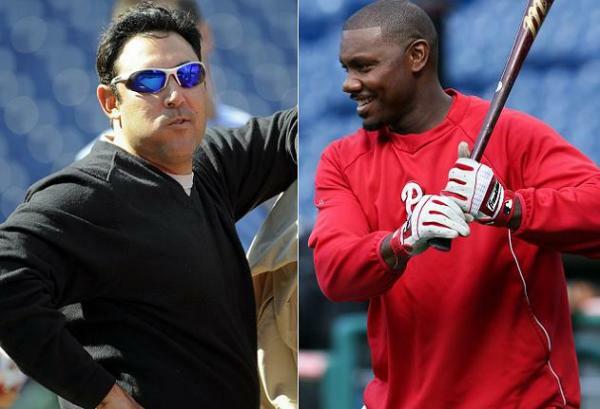 The cost of winning hangs around the neck of the Phillies Fanatic and the organization. Amaro has to cut the ties to the past if he has any chance to improve their lot heading into the 2015 season. The Phillies window of winning opened in 2007, the year they won their first NL East title. The team spent $88 million to win that first division title that year. The most expensive Phillies player that year was Pat Burrell who made $13.25 million that season according to baseball-reference.com. Ryan Howard was one of the best emerging sluggers in the game hitting 58 homer runs in 2006, followed by 47 homers in ’07, 48 homers in ’08, 45 homers in ’09, and 30 plus homers in ’10 and ’11. As he emerged as a fearsome slugger his price tag jumped with the success of the team. The Phillies payroll ballooned from $88 million in 2007 to $94 million in 2008, to $114 million in 2009, to $141 million in 2010 and to $175 million in 2011, the last year they made the playoffs. Howard’s salary went from $10 million in 2008, and then signed a series of deals. The first one payed him $54 million over three years (AAV $18 million) and then he signed a mega deal for $125 million over 5 years (AAV $25 million). As Howard fell to the ground at the end of that 2011 NLDS loss to the St Louis Cardinals, the Phillies window of opportunity it turns out fell as well. Unfortunately for the Phillies the deal they signed during that window is keeping them from opening a brand new window for the foreseeable future unless Amaro’s phone starts ringing. The Phillies tried to keep their core group of the players together while Howard worked he tail off rehabbing the torn achilles. They have been stuck in no man’s land. Do they blow up a team that has been to the playoffs five seasons in a row or break up early and make another run of it with a new core group of players? After a few season of futility Amaro had no choice but to blow it up and retool his roster. His trouble was he had an aging team with a $176 million payroll last season and a last place finish. Amaro started tinkering in the rebuild in 2012 when he dealt Hunter Pence and Shane Victorino away at the deadline. But this off season he has had to go full speed ahead with the rebuild. The for sale sign is out like a tag sale Amaro is willing to make some more deals. Marlon Byrd went to the Reds and reports had the Phillies also sending $4 million to help cover his $8 million dollar price tag this season. The Phillies also sent Jimmy Rollins to the Dodgers along with $1 million to help out with his $11 million dollar salary. Who else can Amaro move before they unload the truck at Bright House Field next month. Look around what can the Phillies offer you. Would you like a proven closer who has a $13 million dollar price tag this season and a vesting option for another $13 million in 2016? How about a horse that can be the ace of your staff who is owed $23.5 million for the next four years plus another option year at $20 million? If you want Jonathan Papelbon how much are you going to ask Amaro to send you back to help with his salary when he wants some prospects coming back to his club. I wrote this weekend about the market for James Shields and Max Scherzer and I was asked in the comment section what about Cole Hamels. Hamels is sitting out there for a team that is built to win right now. He is under control for a reasonable $23.5 million AAV which is in line with what Scherzer is looking for. The caveat is he will also cost a bunch of prospects in return because he is under control and a known payroll number for the next five years. It’s a little tougher finding a trading partner, when that partner has to have a strong enough farm system full of the type of prospects the Phillies need to rebuild, plus they need to able to take on Ace type money and and they probably need to be ready to win right now. As for Ryan Howard who has had some of his prime stolen from him by this ankle injury, how much would you be willing to pay for a player that is now destined to be a full time DH who has seen his home run total fall from solid 40 to 50 homers just five years ago to half of that last season. Ken Rosenthal had a great piece on looking for player comps for Howard. Trouble for Amaro is that the players he comps with now cost a lot less than he does. If he gets moved to help rebuild the Phillies, they are going to have to send a lot of cash along with him in order to get anything back in return. If not, Phillies fan are going to have to hope and pray he is finally healthy and can return back in form. Problem with that is the Phillies window for winning the NL east closed a while ago, and until the phone rings for Amaro the window is staying shut.